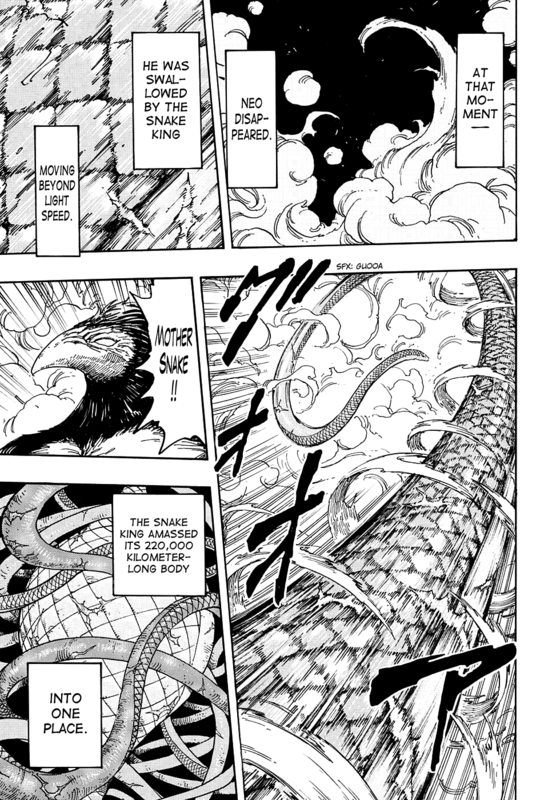 The "Snake King" is the most powerful Mother Snake and the ruler of Area 4. Its power and absolute lordship over one of the major regions of Gourmet World makes it one of the mighty Eight Kings, the eight most powerful beasts in the world. Awareness: Like its fellow kings, the Snake King is especially sensitive to nature, allowing it to detect potential predators, changes in the weather, and natural disasters long before they appear or occur, detecting even the tiniest occurrence that could potential pose a threat to it in the future. This has allowed the Snake King and its fellow Mother Snakes to survive numerous events that would have normally led to mass extinction. Mother Tornado: The Snake King's sheer size and power allows it to create twisters that are so devastating that they last for entire ages and become a daily part of the weather. Mother's Lock (蛇王の消化牢 (マザーズロック) Mazāzurokku, literally meaning "Snake King's Digestive Prison): The Snake King swallows its prey before tying its entire body into a ball centered around its stomach before raising the concentration and acidity of its digestive fluids to dissolve its foe.